Haunted by memories of the 7th Crusade, Warin de Taillur vows to lay down his sword and embrace the monastic life. But first, rescuing an urchin abandoned by a French roadside will be the first step in his absolution. When he discovers the urchin is a young noble woman in need of protection, against his better judgment he agrees to return her home to England. Love for her soon overwhelms him but it’s a love he must hold at bay for he has nothing to offer her other than a scarred heart. Driven from her home, Caperun Keep, by a deceitful aunt, Alyna Caperun must place her trust in the brooding Crusader who rescues her. 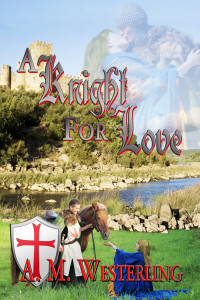 As the only means to recover her castle, she consents to marrying Warin even though she knows he could never love her for anything but her lands. Knows too, he battles demons not even she can fathom. Will they find love? Or will Warin’s past destroy any chance they have of finding happiness together?